A big reason why Guillermo del Toro is so loved by cinephiles (myself included) is that his passion for cinema is evident in almost every frame of anything he makes. Whether it's the stunning cinematography that fills the screen canvas (usually in 1.85:1 aspect ratio, as opposed to 2.35:1) with a treasure trove of production design details and movie homages, the memorable music scores (e.g. you can literally hum the score for Pan's Labyrinth) or the parable-like quality some of his stories have (Crimson Peak, Cronos), you know within the first five seconds that you are watching a Guillermo del Toro film. His signature screen voice is memorable. Other popular filmmakers with signature voices include Martin Scorsese, Spike Lee and Kathryn Bigelow. You know each of their cinematic screen voices because they are distinct -- and because those voices are real. They come from a place of deep affection, curiosity, pain, wonder, fear and conviction. It's why they endure as artists. 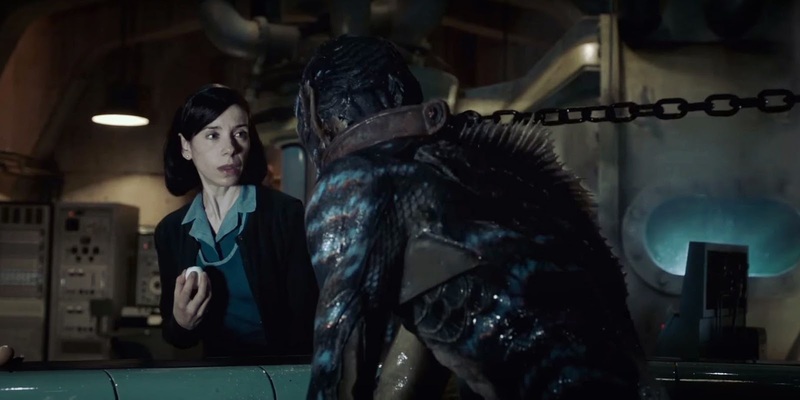 The Shape of Water is del Toro's latest screen spectacle and although it is not on the pantheon of his greatest films, The Devil's Backbone and Pan's Labryinth, it's proof that even a lesser attempt from a great filmmaker is more fascinating to watch than the greatest attempt by an ordinary filmmaker. The invaluable Sally Hawkins (Blue Jasmine) stars as Elisa, a mute custodial worker at a government laboratory. It's the early 1960s, Cold War paranoia is in the air and Elisa passes the time working the late shift with her co-worker and dear friend Zelda (Oscar winner Octavia Spencer). At the beginning of the film, Elisa's routine is established. She gets up late in the day, fixes her work lunch, pays a visit to her across-the-hall neighbor Giles (Oscar nominee Richard Jenkins) and then usually risks punching in late to work -- well, that's if it wasn't for Zelda always saving Elisa's place in the timecard line. Elisa is sweet, hard working and slowly losing herself to heartbreak. She longs for a greater love other than her talent for responsible hard work. Her apartment is above one of those beautiful single auditorium movie houses (I was reminded of the Music Box Theatre here in Chicago) that shows classic films, to mostly empty seats. And considering del Toro, what's a better way to visualize a longing for love than an empty movie house? Much of the pleasure in the first hour of The Shape of Water is watching del Toro set up the plot, put the villainous archetypes in position and then set the stakes, so I won't reveal too many nitty-gritty details other than that it wouldn't be a proper del Toro tale without a creature. In this film, the sole amphibious creature is played by Doug Jones (a del Toro regular) but the real "monster" comes in human form, a government-issue bossman and he's played by the great Michael Shannon (Shotgun Stories, Revolutionary Road). Shannon, in my opinion, single-handedly walks away with the film. Yes, Hawkins is splendid in a performance where she can't speak so it's all up her expressive eyes, but I couldn't help but be swept up by Shannon who takes some risks in what is essentially a made-to-chew-every-scene role. That character could've been a laughable bust but Shannon makes him something memorable. So why isn't The Shape of Water a "great film"? It's one of the those things, where you watch a work and it just doesn't pack the emotional wallop that it's striving so admirably to arrive at. It's not the worst thing. There's so much to admire in parts about the film (even though the second half isn't as formidable as the first half) that it's futile to be disappointed. It's a good film. It's just not a great film. But lucky for us, it's still a Guillermo del Toro film, and that is a gift no matter what.